(Above, left to right) Recent members of the Green and Gold Fund include chief economist Matthew Bush and portfolio managers Margot Beerman and Daniel Sanabria. 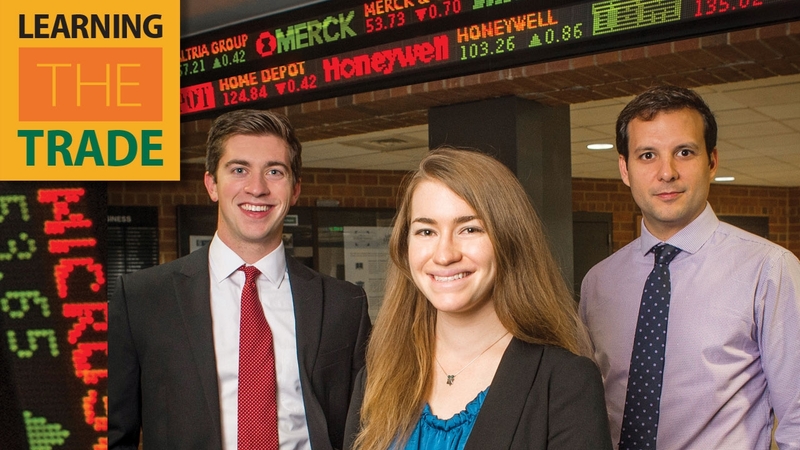 While Rauterkus provides technical expertise, the investments are entirely up to the fund’s student managers, and they have delivered: The Green and Gold Fund is a three-time champion of the RISE national collegiate portfolio competition, and its assets have grown by more than a quarter since its 2006 launch—even with most of its annual returns supporting scholarships for accounting and finance students. The student investors work in a space containing nearly a dozen dual-screened Bloomberg Terminals, the state-of-the-art (and notoriously complex) research tools seen in the trading rooms of billion-dollar firms. Beerman and her team of five analysts use them to follow health care companies like doctors monitoring patients in an ICU—only using terms such as “P/E Ratio” and “free cash flow” in place of medical jargon. The investment policy was designed for a portfolio to fund scholarships in the long term, not big gambles. Every investment fund has limitations, Rauterkus explains, and since Green and Gold uses actual money, mismanaging it can have real-world consequences. Yet students can and sometimes do change the playing field. Though it is uncommon, they could appeal to the fund’s original sponsors to alter the investment policy. Members also take active roles in the companies the fund invests in, attending shareholder meetings by proxy and even casting votes. One former portfolio manager developed a spreadsheet model for optimized risk allocations that still influences the way the students invest. Sanabria knows what he is talking about when it comes to professional investing. He spent the last five years trading for a local hedge fund. After joining Green and Gold, he led a UAB team to a second-place finish out of more than 500 contestants in an international student portfolio contest. The experience recently inspired Sanabria to start his own investment fund, which has raised around $750,000 so far. He has focused on commodities trading outside of school, he says, and the student fund has helped him to experience new markets and types of investment vehicles. “It has also provided me with incredible exposure,” he adds. Green and Gold’s success also led former fund CIO Marian Rough to a career after her 2014 graduation. She now travels the country advising banks on behalf of the federal government. Along with investment know-how, the fund “showed me how to manage others and show that others are valued,” she says. That came in handy when she had to convince a bank CFO to completely reconstruct an investment strategy, for example. Case is currently a third-year finance Ph.D. student at Georgia State University in Atlanta. Although she hasn’t left academia—she plans to become a professor of finance—Case says she values her real-world experience with the Green and Gold Fund. Working with the fund’s Bloomberg Terminals showed her the ropes of in-depth market research, and what she learned as CIO gives her current Ph.D. research an applicability that goes beyond theory and textbooks, she explains. As an undergraduate, Wilson was passionate about the world of investment and was already investing in a personal account when he signed on to the Green and Gold Fund, which enticed him with prospect of managing actual money. As the fund’s CIO, he found a new teacher in the market itself, in addition to his finance professors, he says. Wilson learned valuation strategies that he carried over to his first job as an investment banking analyst in Charlotte, North Carolina, and still uses them on a daily basis as an associate at the investment arm of EBSCO Industries, one of Alabama’s largest privately held companies. Rough started as a nursing student before switching to the Department of Accounting and Finance and joining the Green and Gold Fund, which became the foundation of a thriving career network for her. The fund took her across the country for conferences and contests, including the RISE Investment Forum student portfolio competition in Ohio, where her team won first place in the alternative investments category. The connections she made as fund CIO eventually led to an internship with high-profile futures trading company CME Group. Today, Rough is based in Tampa, Florida, but still travels the country works as a bank examiner for the federal Office of the Comptroller of the Currency. As she consults both small-town bankers and billion-dollar investors, she says that learning to cooperate with others in the fiercely competitive financial market was one of the fund’s most valuable rewards. • Discover the opportunities for education and experience in the UAB Collat School of Business. • Give something and change everything for UAB business students.